^ St. Ignatius of Antioch to the Magnesians (Roberts-Donaldson translation). [2018-04-01]. （原始内容存档于2008-01-03）. ^ The Epistle of Barnabas (translation J.B. Lightfoot). www.earlychristianwritings.com. [2018-04-01]. ^ Sanders, E. P. The Historical Figure of Jesus. New York: Penguin Books, 1993. ^ James D.G. Dunn, Jesus and the Spirit: A Study of the Religious and Charismatic Experience of Jesus and the First Christians as Reflected in the New Testament. Eerdmans, 1997. p. 115, 117. ^ Helmut Koester, Introduction to the New Testament, Vol. 2: History and Literature of Early Christianity.Walter de Gruyter, 2000. p. 64-65. ^ Wright, N.T. The Resurrection of the Son of God. Fortress Press. ^ Catechism of the Catholic Church - PART 1 SECTION 2 CHAPTER 2 ARTICLE 5 PARAGRAPH 2. www.scborromeo.org. [2018-04-01]. ^ McClory, Robert (1989). "The Gospel According to Thomas Sheehan". The Chicago Sun-Times. Retrieved31 March 2013. ^ Sheehan, Thomas (1986). The First Coming: How the Kingdom of God Became Christianity. Random House. p. 111. ISBN 978-0394511986. ^ Sheehan, Thomas (1986). The First Coming: How the Kingdom of God Became Christianity. Random House. p. 112. ISBN 978-0394511986. ^ Peter Kirby, "The Case Against the Empty Tomb," In Price, Robert M.（英语：Robert M. Price）; Lowder, Jeffrey Jay, eds. (2005).The Empty Tomb: Jesus Beyond the Grave. Amherst: Prometheus Books. p. 233. ISBN 1-59102-286-X. ^ Robert M. Price（英语：Robert M. Price）, Robert M. Price（英语：Robert M. Price）, "The Empty Tomb: Introduction; The Second Life of Jesus." In Price， Robert M.（英语：Robert M. Price）; Lowder, Jeffrey Jay, eds. (2005). The Empty Tomb: Jesus Beyond the Grave. Amherst: Prometheus Books. p. 13. ISBN 1-59102-286-X. ^ Robert Greg Cavin, "Is There Sufficient Historical Evidence to Establish the Resurrection of Jesus?" In Price，Robert M.（英语：Robert M. Price）; Lowder, Jeffrey Jay, eds. (2005).The Empty Tomb: Jesus Beyond the Grave. Amherst: Prometheus Books. p. 36. ISBN 1-59102-286-X. ^ Vermes, Geza（英语：Géza Vermes） (2008). The Resurrection: History and Myth. New York: Doubleday. p. 141. ISBN 978-0-7394-9969-6. ^ Vermes, Geza (2008). The Resurrection: History and Myth. New York: Doubleday. pp. 142–148. ISBN 978-0-7394-9969-6。The quoted material appeared in 小型大写字母 in Vermes's book. ^ Resurrection Research from 1975 to the Present: What are Critical Scholars Saying? ^ Does Jesus have a human body right now? - The Interactive Bible. Blueprint Church. Retrieved February 12, 2017. ^ Funk, Robert W.（英语：Robert W. Funk） and the 耶稣研究会. The acts of Jesus: the search for the authentic deeds of Jesus.HarperSanFrancisco. 1998. "John the Baptist" cameo, p. 268. ^ Robert M. Price（英语：Robert M. Price）, "The Empty Tomb: Introduction; The Second Life of Jesus." In Price,Robert M.（英语：Robert M. Price）; Lowder, Jeffrey Jay, eds. (2005). The Empty Tomb: Jesus Beyond the Grave. Amherst: Prometheus Books. p. 14. ISBN 1-59102-286-X. ^ Robert M. Price（英语：Robert M. Price）, "The Empty Tomb: Introduction; The Second Life of Jesus." In Price,, Robert M.（英语：Robert M. Price）; Lowder, Jeffrey Jay, eds. (2005). The Empty Tomb: Jesus Beyond the Grave. Amherst: Prometheus Books. p. 14. ISBN 1-59102-286-X. ^ Richard C. Carrier, "The Burial of Jesus in Light of Jewish Law." In Price, Robert M.; Lowder, Jeffrey Jay, eds. (2005). The Empty Tomb: Jesus Beyond the Grave. Amherst: Prometheus Books. p. 369. ISBN 1-59102-286-X. ^ Bart Ehrman, From Jesus to Constantine: A History of Early Christianity, Lecture 4: "Oral and Written Traditions about Jesus" [The Teaching Company, 2003]. ^ John 3:16, John 5:24, John 6:39–40,John 6:47, John 10:10, John 11:25–26, andJohn 17:3. ^ The ‘‘Parousia’‘ is the term used in the Bible, see Strong's G3952[永久失效連結] for details, which includes theThayer's（英语：Joseph Henry Thayer） Lexicon definition: "In the N.T. especially of the advent, i.e.,the future, visible, return from heaven of Jesus, the Messiah, to raise the dead, hold the last judgment, and set up formally and gloriously the kingdom of God". According to the Bauer lexicon（英语：Bauer lexicon）: "of Christ, and nearly always of his Messianic Advent in glory to judge the world at the end of this age". ^ Reginald H. Fuller, The Foundations of New Testament Christology（英语：The Foundations of New Testament Christology） (New York: Scribners, 1965), p. 11. ^ Vermes, Geza (2008). 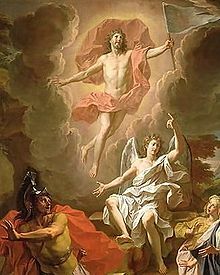 The Resurrection: History and Myth. New York: Doubleday. p. xv. ISBN 978-0-7394-9969-6. ^ Neufeld, The Earliest Christian Confessions (Grand Rapids: Eerdmans, 1964) p. 47; Reginald Fuller, The Formation of the Resurrection Narratives (New York: Macmillan, 1971) p. 10; Wolfhart Pannenberg, Jesus—God and Man translated Lewis Wilkins and Duane Pribe (Philadelphia: Westminster, 1968) p. 90; Oscar Cullmann, The Early Church: Studies in Early Christian History and Theology, ed. A. J. B. Higgins (Philadelphia: Westminster, 1966) p. 64; Hans Conzelmann, 1 Corinthians, translated James W. Leitch (Philadelphia: Fortress 1969) p. 251; Bultmann,Theology of the New Testament vol. 1 pp. 45, 80–82, 293; R. E. Brown, The Virginal Conception and Bodily Resurrection of Jesus (New York: Paulist Press, 1973) pp. 81, 92；Most Fellows of the Jesus Seminar concluded that this tradition dates to before Paul's conversion, c AD 33. Funk, Robert W.（英语：Robert W. Funk） and the 耶稣研究会. The acts of Jesus: the search for the authentic deeds of Jesus.HarperSanFrancisco. 1998. Empty Tomb, Appearances & Ascension p. 449-495. ^ see Wolfhart Pannenberg, Jesus—God and Mantranslated Lewis Wilkins and Duane Pribe (Philadelphia: Westminster, 1968) p. 90; Oscar Cullmann, The Early church: Studies in Early Christian History and Theology, ed. A. J. B. Higgins (Philadelphia: Westminster, 1966) p. 66–66; R. E. Brown, The Virginal Conception and Bodily Resurrection of Jesus (New York: Paulist Press, 1973) pp. 81; Thomas Sheehan, First Coming: How the Kingdom of God Became Christianity (New York: Random House, 1986) pp. 110, 118; Ulrich Wilckens, Resurrection translated A. M. Stewart (Edinburgh: Saint Andrew, 1977) p. 2; Hans Grass, Ostergeschen und Osterberichte, Second Edition (Göttingen: Vandenhoeck und Ruprecht, 1962) p. 96; Grass favors the origin in Damascus. ^ Barnett, Paul William (2009). Finding the Historical Christ (Volume 3 of After Jesus). Wm. B. Eerdmans Publishing. p. 182. ISBN 978-0802848901. ^ Corinthians 15:42–49 with commentary by Dale B. Martin, The Corinthian Body, Yale University Press, 1999. ISBN 0-300-08172-3 p. 126 in particular. ^ "Archbishop Peter Carnley; William Oats". Radio National. ^ Ignatius makes many passing references, but two extended discussions are found in the Letter to the Trallians（英语：Letter to the Trallians） and the Letter to the Smyrnaeans（英语：Letter to the Smyrnaeans）. ^ The Trinity by Saint Augustine (Bishop of Hippo. ), Edmund Hill, John E. Rotelle 1991 ISBN 0-911782-96-6page 157. ^ Lorenzen, Thorwald. Resurrection, Discipleship, Justice: Affirming the Resurrection of Jesus Christ Today. Macon, Georgia: Smyth & Helwys, 2003, p. 13. ^ "Bahá'í Reference Library - Some Answered Questions"